201, Second Floor, Polaris Building, Stadium Circle, Navrangpura, Ahmedabad. Dr Saurabh Goyal is a leading name and best joint pain doctor in Ahmedabad in the field of joint replacement surgery; he always achieved top position in his studies. He did M.B.B.S (Gold Medalist) from RNT Medical College in 1993 and M.S (Orth) from S.M.S medical college, Jaipur Rajasthan. After that, he shifted to Ahmedabad and earned a good name in orthopaedic and joint replacement field. 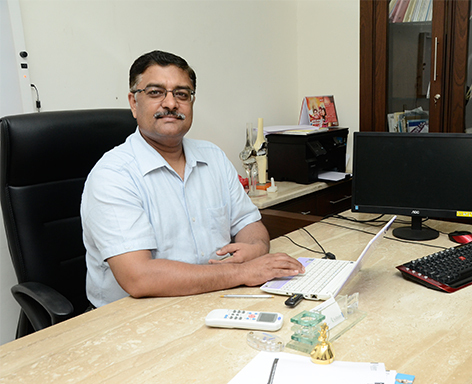 He has performed more than 15000 joint replacement surgeries In the last fifteen years of his practice. Dr Saurabh Goyal has been worked for 10 years at Shalby Hospitals, Ahmedabad. This is one of the premier centers of the globe within the field of joint replacement surgery. He has done more than 9000 joint replacement surgeries together with primary and revision knee ad hip surgery and shoulder surgeries here. He is top knee replacement surgery doctor and at present attached with Sterling Hospital and Rajasthan Hospital in Ahmedabad. Dr Saurabh Goyal attended the current concept meeting of the Ahmedabad Orthopedic Society at Ahmedabad in month of July 2001. Dr Saurabh Goyal attended the 46th annual conference of the Indian Orthopedic Association at Ahmedabad and pre-conference workshop on arthroplasty in the month of December 2001. Dr Saurabh Goyal attended the 21st annual conference of Gujarat Orthopedic Association at Ahmedabad in the month of February 2003. Dr Saurabh Goyal attended the 1st annual conference of the Indian Society of Hip and Knee surgeons at Mumbai in the month of April 2006. Dr Saurabh Goyal attended Current Concept in Joint Replacement meeting at Las Vegas U.S.A. in the month of May 2006. Dr Saurabh Goyal attended the intelligent knee surgery course at Ganga Hospital, Coimbatore in the month of July 2006. Dr Saurabh Goyal delivered a lecture on “Prophylaxis treatment of antibiotics in implant surgery” at Ahmedabad in the month of March 2004. Demonstrated saw bone TKR at the golden jubilee annual conference of Indian Orthopedic Association at Mumbai in the month of December 2005. Dr Saurabh Goyal delivered a lecture on “selection of patients and pre-op assessment” at the workshop for Chinese surgeons at Shalby hospital, Ahmedabad in the month of March 2006. Dr Saurabh Goyal delivered a lecture on “Arthritis and its prevention and treatment” at the meeting of general practitioners at Krishna Hospital, Ahmedabad in the month of June 2006. Dr Saurabh Goyal delivered on Preoperative planning and selection of patients in TKR, TKR in flexion deformity & TKR in severe varus deformity & the knee arthroplasty workshop organized at Sir JJ medical college and hospital, Davangere, Karnataka in the month of Sep 2008. Dr Saurabh Goyal delivered lecture on Arthritis and its prevention at the “JOSH” conference (Conference on Occupational health) at Jamnagar in the month of Jan 2009. Dr.Saurabh Goyal Participated in the orthopedics camp at the meeting of Gujarat Institute of Civil Engineers and Architects, Ahmedabad. Dr Saurabh Goyal Participated in the orthopedic camp at the Batrisi Jain Sewa Samaj at Ahmedabad. Dr Saurabh Goyal Participated in the orthopedic camp at Unjha, Gujarat. Dr Saurabh Goyal Delivered a lecture on Arthritis and its management at the Non resident Indian Parents association at Shalby Hospital Ahmedabad. Dr Saurabh Goyal Delivered lecture on arthritis at senior citizen club at Naroda, Ahmedabad. Dr Saurabh Goyal Delivered lecture on arthritis at senior citizen club at Nadiad Gujarat. 2nd July 2014 Dr Saurabh Goyal Delivered lecture on osteoarthritis at senior citizen garden Ahmedabad. The Solitaire clinic is established by Dr Saurabh Goyal in the year of 2012 in Ahmedabad, Gujarat holding exclusive knee replacement & joint replacement theatres which are best in the class.